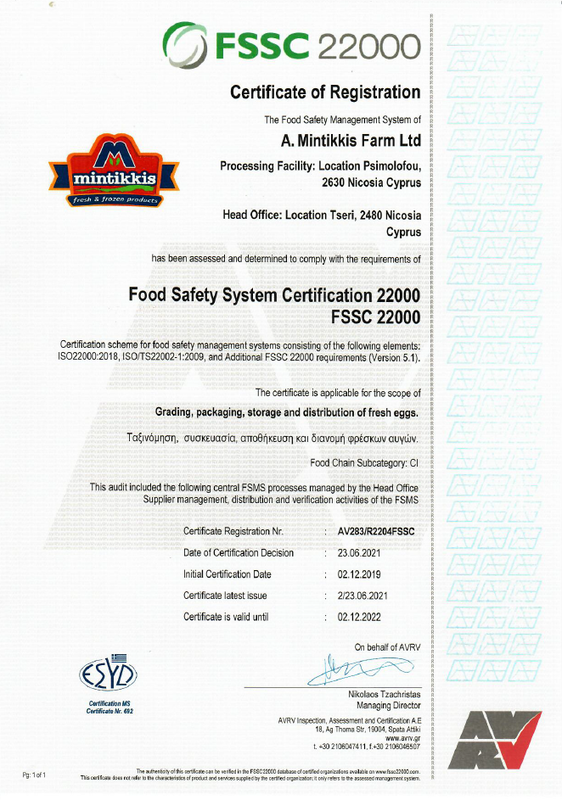 A. Mintikkis Farm Ltd is committed to producing and distributing safe products, that are of high quality and hygiene, with the purpose of fulfilling customers' expectations and demands. We provide all necessary resources for the production of safe products and adopt practices that are consistent with this policy. We commit ourselves to the implementation of the Food Safety System FSSC 22000 and provide all the required resources for its continous, effective and effficient implementation. We stay up to date with legislative requirements and ensure their application throughout all spectrum of business procedures. We implement all good manufacturing practices as well as invest in continuous training of our staff in matters of safety, quality and hygiene. We upgrade and improve our establishments, equipment as well as our production processes to optimise production and consequently the quality of our products. We establish measurable targets and monitor their achievement through review of the system. We provide all adequate working conditions for the creation of a safe working environment. There is continuous effort through necessary measures to protect the environment and to comply with relevant environmental legislation. We communicate to employees, customers, suppliers and authorities, our commitment to provide safe and quality products and aim to develop beneficial relationships with everyone involved. The targets, specifications, procedures and policy are reviewed and revised constantly so as to achieve their continuous improvement.